Viacom 18 Media, which broadcasts the television channel Colors in India, has launched its United States operation Aapka Colors. When Colors was launched in India two years ago, it was placed eleventh in a field where one group led for nine years. Within a week of its launch, Colors jumped to No 3, and in the ninth month, No 1. "We want to replicate that success in the US market too," Rajesh Kamat, group chief operations officer, Viacom 18, and chief executive officer, Colors, said. Harish Chawla, group CEO, Network 18 and Viacom 18, said Colors became successful because it picked up new issues and different content, redefining the media space in India. "We are like a food court that caters to the tastes of different palettes. It is a unique blend of entertainment through scripted series, reality shows and blockbuster Bollywood films," Kamat said. "One of our key strategies for this market is that there will be no lag in the telecast of episodes versus India thus ensuring that the viewers in this market are always up to speed with all our key shows," Kamat added. He said the channel, whose content is based mostly on Indian themes, would soon start producing and airing programs from the US. Viacom 18 Media is an equal joint venture between the US media giant Viacom and Network 18, one of India's leading entertainment conglomerates. They launched as a Rs 1 billion ($22 million) company which grew to become a Rs 10 billion ($220 million) company in two years, Chawla said. 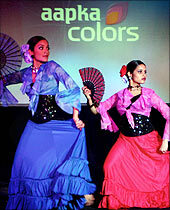 Aapka Colors is being distributed exclusively through the Dish Network, which telecasts channels from nine Indian languages. Dish Network offers the new channels as part of the Hindi mega pack, which currently offers 16 other Hindi channels and the Hindi super pack, both of which include all top channels from India. "Dish Network has led international programming innovation for the US-based South Asian community since 1998," Chris Kuelling, vice president, international programming, Dish, said. Amitabh Bachchan, who is the brand ambassador for Aapka Colors, said in a videotaped message, 'Though my association with the Indian channel began recently with one of its most successful shows in recent times -- Bigg Boss Season 3 -- I have been watching it for over a year. "Now, I feel honoured in being able to partner with a media channel that has been a conduit of social change while churning out excellent quality entertainment. I am sure Aapka Colors, with its myriad hues of entertainment, will spread its magic in the US as well,' he said.